Escape-Central > PERSONALIZE your Escape! > MODIFICATIONS > Grillifications!!! 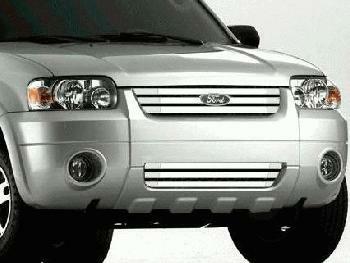 Would You Put a Custom Grill On Your Escape/Tribute? 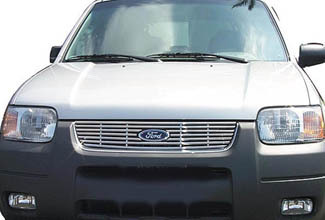 Has anyone replaced their Escape or Tribute's grill with a custom one? WatchDevil's Escape "427" Grill !!! ____Click above picture for fullsize view! Nice, I'm thinking of getting the 3 piece one from E&G. Did you put it on yourself? 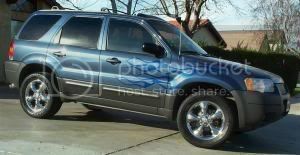 The reason I ask is that I have one from wheelhorse thats similar to that and it says that I have to remove the front bumper/light assembly. I cannot figure out how to get the lights out. "Too cute ute" says that that isn't necessary tho. He just took out the factory grille and I don't see how to remove it either. Help Please!!!!!!! I don't actually ahve the grill, but it bolts through the stock grill, you don't have to remove anything. * Remove 6 pin-type retainers (3 each side, front of wheel well). * Remove 4 front bumper cover bolts (2 each side bottom of wheel well). * Remove 2 front bumper cover to front fender pin-type retainers (1 each side). * If equipped, disconnect the fog lamp connectors. * Remove the 3 lower front bumper cover bolts (bottom of bumper cover). * Remove 2 pin-type retainers (top of lowest grill opening). * Remove the 2 upper front bumper cover bolts (1 each side - top of bumper cover). * Release the 9 clips and remove the radiator grill from the bumper cover. Disclaimer: I haven't actually tried this and don't plan to. Canadian scape have you noticed the "Cloudrider" grille that Evan and I have on our Escape's. It is quite inexpensive and installs in under five minutes. Sorry Gary Document Not Found on your link. Hey, what self respecting guy would go by the name too cute ute. All women here. 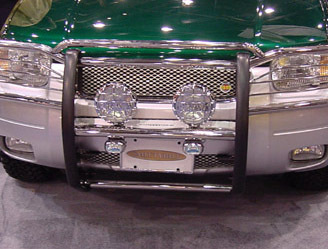 The grille just unbolted on the top sides. Has clips on the bottom. I don't remember if it had screws on the top or not. It does now as my new grille required cutting the top off the old one and attaching it to the new one. Came out really quickly. 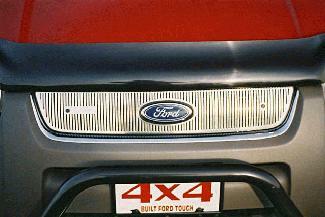 Maybe your new grille has to hook in a different way. Canadian scape look at this site: http://escape4ever.freehomepage.com/ choose photo page, then scroll to the right and down to almost the bottom. You will see Evan's and my front grille. Gary, Wow! Great pictures! You know, every time is see your pix with that beautiful scenery in the backround I get a little jealous. So I decided to take my Escape on a little journey to see how it would look with the same backround. Ahhhhh.............looks like it belongs there. I laughed out loud Behr. My wife thought I was losing it. Your Escape looks good in that picture, but my T-Red looks great. thanks all for the info. I am going to pull out the cd and have a looksee. Will let you know how it turns out! 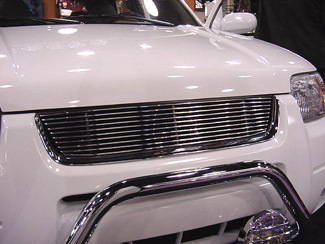 That grill looks great escape4ever, did you get it in Canada or did you have to order it from the US? And how about that crome rear lift handle? You've got a nice rig there!